You don't need a lot of space to grow fresh vegetables, herbs, and fruits. You don't really even need a garden. As long as you have a pot, some dirt, water, and sun, you can grow some tasty things. Plant breeders know that after taste, home gardeners want a high yield in a small space, so they develop varieties that can grow in a small footprint or even live in containers all year long. Vegetable gardening used to be the poor relation of ornamental flower gardens. Perennial borders reigned, and large, messy, vegetable gardens were hidden in the backyard, usually the domain of the man of the house. Vegetable gardens were about producing food, not beauty. Now that vegetables have taken a more prominent place on the table, they are gaining more respect in the gardening world. With the increased interest from home gardeners, there has been a surge in the planting of heirloom seeds and the development of new hybrid varieties: colorful novelty vegetables, ethnic varieties, and compact growers. You don't need a large area to have a vegetable garden. You do need good soil, plenty of sunshine, a water source, and probably a fence. If you think the deer love your hostas, stand back. The entire woodland community is going to enjoy your vegetable garden. If you plant it, they will come. 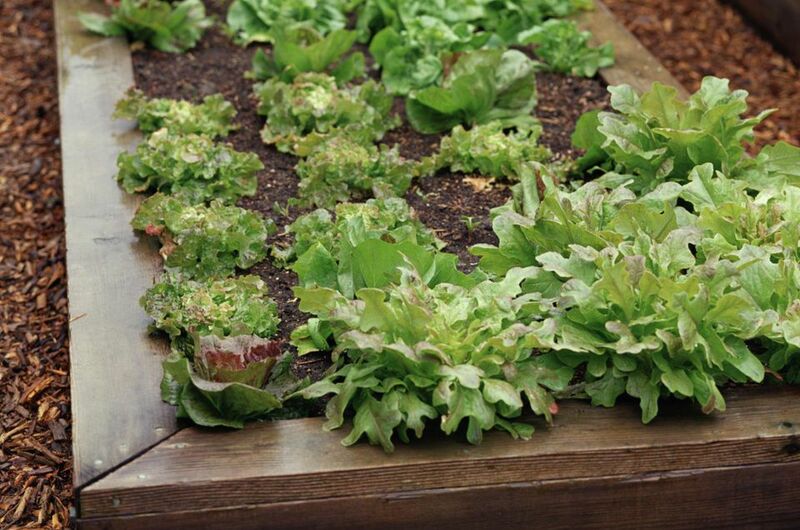 If you have a small sunny spot in your yard or even on your patio, you can grow vegetables. Here's how to get started. Sun: Vegetables need a good six or more hours of sun each day. Without sun, the fruits will not ripen and the plants will be stressed. Even if you are sun challenged, there are a few vegetables that can survive in light shade, such as lettuce and other greens, broccoli, and cole crops. Water: Vegetables also require regular watering. Otherwise, they will not fill out and some, like tomatoes, will crack open if suddenly plumped up with water after struggling without it for a while. You can't always rely on rain. If you have the means, a drip irrigation system is a definite plus for a vegetable garden. The new component systems are really quite easy to install and cost a lot less than most people think. And you'll save money on water because it goes directly to the plant's roots. Less is lost to evaporation. Even a simple soaker hose is better than a sprinkler system that gets the leaves all wet, leaving plants prone to blights and mildews. If you don't want to opt for drip irrigation, site your vegetable garden near a water spigot. You'll be more likely to water if you don't have to drag the hose or watering can very far. Soil: This final consideration is essential. Vegetables need a soil rich in organic matter. The soil is important to the growth of all plants but even more so with vegetables, because even taste is affected by the quality of the soil. That's part of why wine from the same grape variety can vary from region to region and why some areas grow hotter peppers than others. If you can provide these three basics: sun, water​, and great soil, you can grow a vegetable garden. Granted, a small vegetable garden may not be enough for subsistence farming, but it will be enough to grow great-tasting tomatoes, some beautiful heirloom eggplants, or a vast supply of cutting greens. If you have limited space, consider what vegetables you can purchase fresh in your area already and what vegetables you truly love and/or miss. Compact varieties: If you must have a giant beefsteak tomato or a row of sweet corn, the space for growing other vegetables in your small vegetable garden will be limited. But even then, you can choose varieties that are bred to grow in small spaces. Anything with the words patio, pixie, tiny, baby, or dwarf in the name is a good bet. Just because a plant is bred to be small doesn't mean the fruits will be small or the yield will be less. Most seeds and seedlings will tell you the mature size of the plants you are selecting. Knowing that, you can space things out and see just how much you can fit into your location. More likely, however, you will do what most gardeners do and squeeze in as many seedlings as you can fit into your garden, then deal with the crowding later. That's one way to get a large yield from a small space but not the best. If you are truly short of space, interplant your vegetables with your flowers. There's no rule that says you can't mix the two. It can be a bit harder to harvest, but many vegetables can be ornamental in their own right. As a bonus, flowers also bring lots of pollinators to your veggies. Growing up: If you do opt for a variety of vegetables in your garden, look for compact varieties and also vining crops that can be trained up on supports. Pole beans take up less space than bush beans. Vining cucumbers and squash, as aggressive as they can be, actually take up less area than their bush cousins. Companion planting: Companion planting is often touted for the benefit of cutting down on pest infestations, but it also serves to conserve space. Shade-tolerant plants benefit from being planted next to taller crops. Basil likes a respite from the hot sun and does well next to tomatoes. Lettuce will keep producing all summer if shaded by almost any taller plant. Early harvested vegetables, such as spinach, radishes, and peas, can be planted with slower-growing crops such as broccoli or peppers, which will not take over the space until the spring-harvested vegetables are gone. Succession planting: Succession planting is a useful technique for any vegetable garden, large or small, but it is all the more valuable when space is limited. Succession planting means reseeding quick-growing crops every two to three weeks during the growing season. It is especially useful with crops such as beans, zucchini, and lettuce that tend to exhaust themselves producing so much. By successively planting, you will have just enough produce for your family's appetite and you'll have it all summer, not all at once. Rotating your vegetables so they grow in different areas of the garden each year is cuts down on diseases and insect pests that overwinter in the soil, but this really isn't possible in small vegetable gardens. You'll just have to be vigilant about not letting problems get out of hand. If a large-scale problem should occur, such as squash beetles or septoria leaf spot on tomatoes, seriously consider not growing the crop for a year. It will be a sacrifice, but one year without is better than several consecutive years of a disappointing crop. As with ornamental container gardening, vegetable container gardening is a way to control the soil, sun, and growing conditions of your edible plants. It also allows squeezing edible gardening into the smallest spaces, by putting them on your patio, front steps, and along the house and driveway. Virtually any fruit, vegetable, or herb can be grown in a container if the container is large enough for it. Herbs and greens can grow in small pots or hanging baskets; fruiting plants such as tomatoes, peppers, and cucumbers work best starting at 5-gallon containers—or go larger, of course. The larger the pot, the more soil you can fit in there, and the less often you'll have to water (daily or every other day instead of twice a day). The material the pot is made of and its color also affects how quickly it dries out. Clay pots lose moisture faster, and black pots retain more heat. You can even find soil specifically balanced for vegetable container gardening with slow-release fertilizer already in it for the most absolute no-fuss garden. Growing edibles indoors on a windowsill is an easy, low-space option for plants that are frequently harvested, such as herbs and lettuce. But this idea isn't just for gardeners with limited space. Any gardener can extend the growing season by potting up some herbs for indoor growing. If you have enough sun, you can even grow some vegetables indoors.